Can I receive cash back at closing from a VA home loan? This is perhaps the most asked question we receive from first-time homebuyers, and for good reason. At some point or another, most of us need to navigate the waters of financial hardship. Whether this is your first or 10th home, quick cash-in-hand may be beneficial if you are in need of immediate money. Cash-back mortgages are loans that enable the buyer to purchase a home without a down payment, or that allow you to take equity out of your current house in the form of cash for discretionary usage. 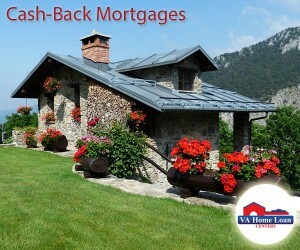 Appealing for obvious reasons, it is crucial to understand the pros and cons of cash-back mortgages. Pertaining to cash back on a VA loan, the answer is both yes and no. Among the numerous benefits provided by the VA loan is the no down payment requirement. Beyond that, per the VA Lender’s Handbook “Cash to the veteran from loan proceeds is permissible only for certain types of refinancing loans and under very limited circumstances…” For other types of refinancing loans and all acquisition/purchase loans, cash-out is not permissible. In the case of IRRRL/Streamline refinancing loans, borrowers are only permitted cash back under one circumstance if they are given a reimbursement for the cost of energy efficient improvements. This reimbursement can be up to $6,000, and the improvements must have been made within 90 days of closing. The United States Department of Veterans Affairs does allow a limited amount of cash back for a VA purchase loan. The amount of money received may not be more than the capital contribution that the borrower has invested in the transaction. For example, a borrower may receive a refund of their earnest money deposit, appraisal fee and home inspection fee (as long as they have paid for these and the seller has agreed to refund their payment). Repairs made by the seller, credits for repairs and closing cost credits are not considered cash back. In the event, that a property is in need of extraordinary repair, a type of rehabilitation / construction loan is now available. The government insured FHA 203k loan will allow a homebuyer to borrow up to 97.5 percent of a property’s future (after rehab) market value. The funds must remain in an escrow account and will be paid out as the work is completed. Call 888-573-4496 for more information. If the transaction is a refinance, cash-out is allowed. The maximum an eligible borrower may take out is 90 percent of the appraised value. The exclusion is if the transaction is a VA to VA loan where the purpose of the refinance is for a lower interest rate and lower payment. Further questions about VA loans and cash back can be answered by VA Home Loan Centers, contact us at 888-573-4496.